This morning at breakfast in Bhutan, my travel partner Susan and I got to talking about how our views on longevity have changed. I mentioned that I am making an effort in my Years of Living Travelly to go to places like Corregidor, rather than the “easier” places in a port of call, because I understand so much better now what it means to die young. I used to think that whether one lives twenty, or eighty years, or points in between, any lifetime is really a blink of the eye when one considers time in the abstract. All the dead aren’t here anymore, regardless of how long they lived. When I think now of people who died young, I understand so much better what it means not to have had the opportunity to experience everything that can happen in a long lifetime. I think of all my opportunities to learn, to travel, to make friends, to love. It’s all that, and a host of simple things as well, like hearing a new song that becomes a favorite, wiggling toes in sand, the first sip of icy beer on a hot day, or watching a baby discover just about anything. 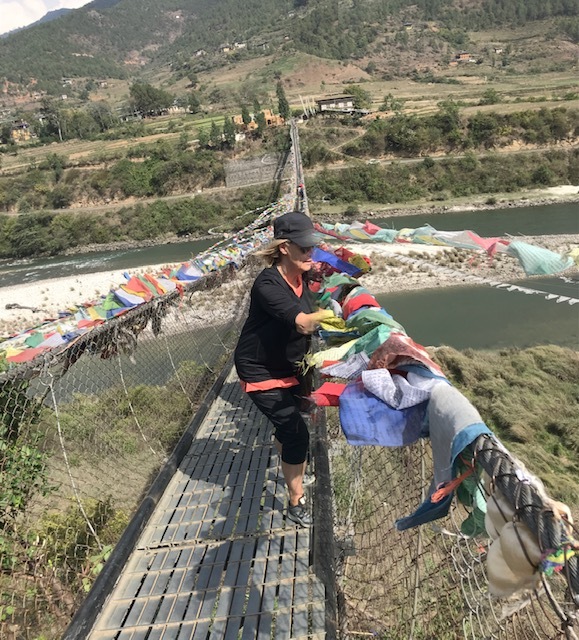 The previous day, when we saw the thousands of prayer flags that flutter on bridges, near shrines, and pretty much everywhere there is a breeze or a memory, we decided we wanted to put up some flags of our own. 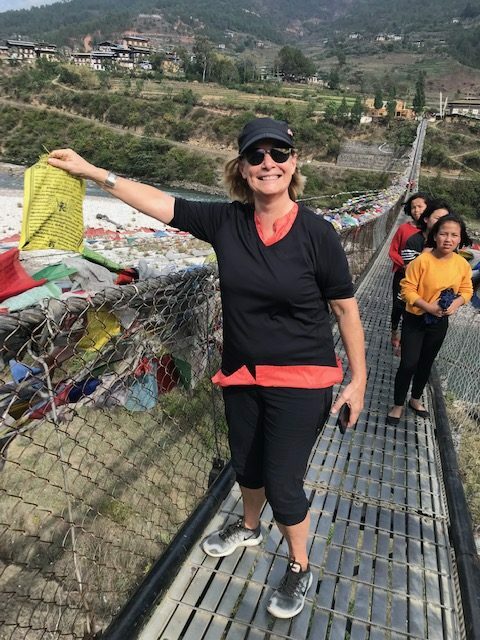 I wanted to honor my friend Peter, whose happiness when he came back from Bhutan made me put it on my bucket list. He had been just about everywhere, and it was one of his favorite trips. Peter died not too long after that, and Bhutan was his last travel adventure. I have Peter to thank for making it one of mine as well. We began today shedding a few tears about people we have lost. 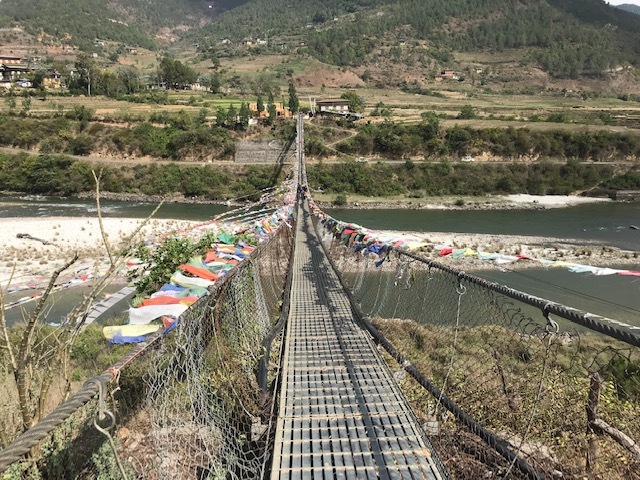 In the afternoon we went to the longest suspension footbridge in Bhutan. ( pictured at top), carrying the bundle of prayer flags we had bought the day before. I put up one string of flags for Peter, to invoke his spirit in this beautiful place and to say thank you. Here I am with his flags. But those of you who know me well probably know what this journey to the bridge was really about. This is the twentieth anniversary year of the death of my son Adriano. I wish he had stayed in this world longer than twenty-two years, but he didn’t want to. I think of how much he has missed, but I have to acknowledge that mixed in with all that he might have enjoyed, there was most likely a disproportionate amount of pain and disappointment that he has not had to suffer. Grief that softens over time as part of healing can be, in an instant, raw again. But rawness is good too, because it brings us closer to those we have lost, before we tuck them away again in the emotional labyrinth that life becomes after something so heart blistering happens. I wanted to be raw again in Bhutan today, because I wanted to honor his spirit and say again to him how much I love him. There is a timelessness and a purity I can’t really explain about the love I feel for someone I haven’t been able to see, touch, hear, or talk to for two decades now.Nothing can tarnish that love’s beautiful, burnished shine. The good memories win. In the letter he left behind before he took his life, he said if there was something after death, he would be out there surfing the universe. I always think of him that way. And here in the foothills of the Himalayas, as close to the concept of eternal time as one can get on earth, I think that if indeed there is surfing to be done in the afterlife, he has simply beat me to it by a cosmic second. I heard somewhere that the Northern Lights are reflected off dust in the atmosphere, so I took some of his ashes to the top of Norway the year after his death and I flung them as high as I could into the sky. I wanted him forever to be part of that dust. Now he is part of the Himalayas as well. As am I, because I left a little of my heart on that bridge too. In this part of the world, these flags are really more about hope for good fortune for the living, not memorials to the dead. And that was part of what I was after today as well. I wanted to leave the flags at a bridge because bridges are symbols of transition—sometimes sad, as when a loved one leaves us, but they also stand for hope and for the fact that to be truly alive we must embrace change. The real finality of death is that it is the last bridge we cross. But neither I nor anyone I love is there yet, at least if our good fortune holds. So the deepest meaning of today for me—and the biggest surprise—was how joyful I felt. Even playful, as this photo of me with one of Adriano’s flags shows, although my eyes are red with tears behind the glasses. .The flags are for good fortune and I am grateful for the abundance of that in my life. The joy today came from thinking about the future for my son Ivan and myself, that we still have not only bridges to find, but bridges to make. It’s raining in Bhutan tonight, a sound I haven’t heard, and a fragrance and freshness I haven’t breathed for a long time. Out there in the dark, two strings of flags are limp with rain. Tomorrow the warmth of the sun will raise them up to flutter and wave beneath the hovering peaks, and lend their colors to the river. below the bridge, bringing snowmelt from the Himalayas down to the sea. I am headed there myself in a few days, as my life adventure continues. I am leaving something behind, though, and carrying something far bigger with me, in the mark this has made on my heart.